For those of you who have read my discussion on our short vacation, here is a photo of the bed that just wasn't inviting enough for my fiance and I. It may have been because the bed was bigger then what we were used to and there was room for two more people on either side of us, that and the place was new to the both of us. 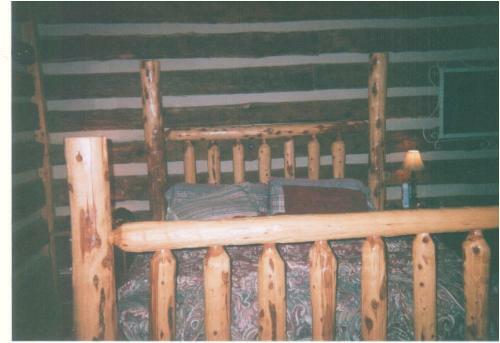 Anyway, attached is the photo of the bed, and although it appears to be very cozy, and infact it was, we just could not get comfortable enough to stay the night, let alone the three days that were allotted for the cabin. Have you ever been so homesick that you cut your vacation short and went home? How long of a drive was it or did you have to take airfare? Oh Boy, that is one funky looking bed. But I don't think I leave early fro my vaccation. Couldn't you just sleep and don't think about the bed. Or move to a different cabin? It wasn't really the bed, the bed was comfortable, it was just the fact that we were alone... I appreciate the response. Yeah I know baby this photo should help mylotters who remember your other discussion see the bed we were dealing with when we went on our really short vacation,and I agree the bed was not inviting,and it might have been that it was big enough for like four people,and the place was also very new to us,and the bed does look very cozy and it did seem to be cozy,but it was not comfortable enough to spend three days or even one night in,I do not think I have ever cut another vacation short to go home,I love you.